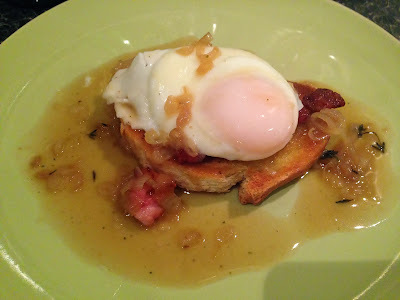 Oeufs en Meurette is a classic French bistro dish of poached eggs in a Burgundian (Meurette) sauce. It's a rich, eggy start to a meal which for me is usually followed up with a bloody steak and rustling fries. Around New Year in the Hungerlust family we always treat ourselves to a fancy steak and so, to recreate my favourite bistro meal I'm cooking my take on oeufs en meurette, Oeufs à la bière or poached eggs in carbonnade sauce. I've followed the classic meurette recipe but switched out the wine for a bottle of Leffe blonde. When this beer replaces wine in the sauce it begins to look a whole lot like a carbonnade, hence the name. After reducing the beer for the sauce it was extremely bitter and frankly weird, so I reached for the nearest source of sweetness, a bottle of golden syrup. A tablespoon of this was all that was needed to balance it out and the slight sweetness worked well with the bacon. A bottle of something a bit sweeter would have balanced the sauce a little better than the Leffe and sticking with a Belgian theme I would go with a dark abbey ale, a quadruple or a scotch style ale. 4 very fresh, free range eggs. Over a low heat fry the shallots in the remaining bacon fat in the pan. Boil the beer over a high heat in a large pan with a sprig of thyme until reduced by half. Add the chicken stock and reduce by a further half. Melt the butter and cook out the flour to make a roux. Blend the roux with a couple of tablespoons of the reduced beer and then mix it back in the to the pan of beer. Carefully poach the eggs in a large pan of water. Meanwhile rub the slices of bread with a little olive oil and toast in a griddle pan or under a hot grill. To serve, place a piece of toast on the plate. Sprinkle the bacon pieces on and around the toast. Top with an egg and spoon a generous amount of the sauce on and around the toast.